Examples include: How to perform surgery, what to check for in a crime scene, etc. Game Simulation Design: From Survival Sim to the Enigma Challenge…. Survival Example: What do we have? How much time do we have? How would we use each item to survive and why? Another great eLCC conference! My biggest take-away was the concept of the One-Button Video Studio. Ling posted the video overview from CU Denver. I hope we can collaborate with ITS and get our very own one-button studio set up. We can have much guidance from CU Denver and the software that runs it is open sourced. The budget seems reasonable. 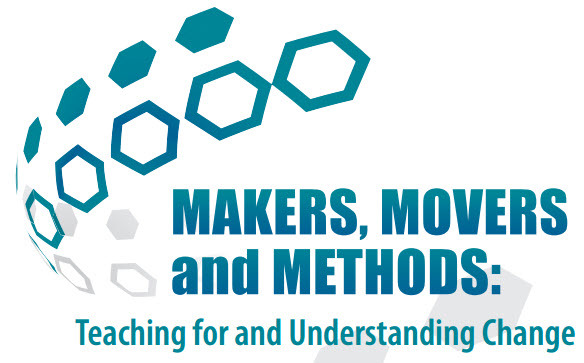 I know there are several faculty from across colleges that have indicated that they would like to learn how to create videos for their courses. I presented this year on the topic of "Mindful Living and Learning in a Digital World." Feel free to contact me if you'd like a copy of the PowerPoint, it is chock full of ideas, articles, and resources. I attended two excellent hands-on sessions. One was about leveraging social media and utilizing special sites for Social Activism by Sherry Jones. I found a couple of the tools personally helpful to know. One in particular, is countable.us (both a website and an app). The tagline for countable is "Your government, made simple. Get clear, concise summaries of bills going through Congress, see what others think, then take action. Telling your reps how you feel is easier than ever with email and now video messages. Make your democracy more responsive!" And the other tool I really thought would be helpful for all who want to examine both sides of the debate on an issue. http://www.intelligencesquaredus.org/ It is "a nonpartisan, nonprofit organization, Intelligence Squared U.S. was founded in 2006 to restore civility, reasoned analysis, and constructive public discourse to today's often biased media landscape." After looking at this website and sampling a debate that was posted I found it to be a safe and reliable source for understanding the main perspectives on important issues. Another hand-on "active" session was modeled after the Escape room concept. Kae Novak, Krystan Grant, and Marcus Fowler had us dive right into solving a fun problem and applying our digital literacy skills for gathering clues and finding answers from a variety of sources in the room. It was a lot of fun (and we did eventually escape!) I can really see how setting something like this up for a classroom would be incredibly engaging and memorable. Kae and her colleagues have a few outlines and tip sheets for building your own escape room activity. Let me know if you would like to see these resources or if you would like some help. A real beneficial use of 3D Printing still seems to be a mystery even to some institutions who have invested substantial money, time, and resources to the search. There is always the example of the prosthetic program for kids who have had amputations, but scant few well known examples beyond that. At the ELCC conference Robin Weber from UNC presented her college's efforts 3D printing an while interesting I don't see where that university has even come close to recovering its investment. What she offered as examples of their output fit in a quart sized ziploc and largely amounted to toys. The few items that users had paid them to produce included four plastic Hindu type elephants with articulated legs and model of a medieval baptismal font that might work with the Guinevere Barbie Knights of the Round Table play set. Robin did share a lot of discoveries that would be useful to anyone who was actively engaged in working with 3D printing such as effectiveness of materials, costs, practical planning in terms of time and maintaining equipment, but she ended it with the same question that I've heard at every 3D print presentation I've ever attended which is "So do you have any ideas on how we can use this technology in the academic setting?". This technology which seems like a perfect fit with academics still struggles to find a need. I think that if an institution had an engineering program a 3D Printing lab would be very busy, but in absence of that, everyone keeps asking the same question what do we do with it? 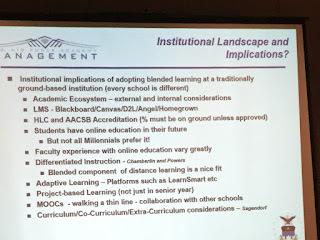 More practical, Dave Thomas of CU Denver shared an amazing road map for transitioning to a new LMS. Specifically CU-D went to Canvas, and on an aside, while not a salesman for Canvas, Thomas couldn't say enough good about it. The presentation was not a gloom and doom everything that could possibly go wrong did typical LMS migration story. Thomas admitted there was a lot of work and some things they could have done better, but a well planned path resulted in a successful migration. While Regis is not planning [to my knowledge] to leave D2L, if we ever started down that path I would suggest we reach out to Dave and his team for advice. The best session I attended this year was CU Online’s Creation Station. The Creation Station was modeled after the One Button Video Recording Studio, a brain child of PennState University. This studio is a self-service resource for faculty and staff to create high-quality videos with just the push of a button. The studio is fully outfitted with professional lighting, a video camera, a backdrop, and a microphone that all work simultaneously by inserting a flash drive and hitting a button. The rough cost estimate is $13k, which I personally think is a very reasonable price. I wish this is a project Regis will consider. The beauty of the project is that CU has done all the ground work. They are willing to share everything they know to us if we’re interested. We’ll know exactly what hardware and software to purchase for the studio. If you are ever worried about transitioning from one LMS to another, the good folk at CU Denver can put your mind at ease; as long as you're transferring to Canvas. In addition to being the clearest, best structured session I attended, "Our Life with Canvas" provided me a good deal of insight into how to successfully change LMSs and to then take advantage of your new tools. Further, some of the key points for making a smooth LMS transfer apply to general training and use of LMS's by anyone. Do not make the transfer decision only in your IT department. Nobody likes having changes forced upon them; everyone likes a sense of agency, and there is a lot of talent around your university that should be involved in making (and then championing) a good decision. Once you've made a university wide decision to start using a new LMS, launch it slowly, and in semester-long stages. Stage 1: Tests. Implementation should take advantage of your early-adopters and highly tech-proficient educators. In this first stage, you can begin to work out (or at least find) bugs that may hassle the course transfer process. These initial successes will help set the stage for future course-transfers while also working out the bugs with profs that can handle some hassle. Stage 2: Opt-in. Implementation provides all profs the opportunity to start using the new LMS; whether as a sandbox or as a complete course replacement. This is a full semester long stage that lets professors know it is their decision for now and gives them time to play with the new LMS before they have to start using it all the time. Stage 3: Opt-out: implementation allows those profs who still don't want in to hang on to their old ways. Say for instance that a prof is teaching his final course at your university... why would he want to learn new software on his way out? This stage gives profs a final opportunity to use their old content and to feel like they are not being forced into anything. Stage 4: Mandatory. Now nearly 2 years into an LMS transfer, finally require that all profs use the new LMS. At this point, your IT team and the community will be well versed in the new LMS and can provide the best support to those educators who were most reluctant to switch. A few additional tidbits shared by the presenter (Dave Thomas, Director of Academic Technology, CU Denver) act to really help in those transition moments to keep people happy and successful throughout. If you provide self-service course transfer to professors, pay them a little bit for their time; as little as $250 can acknowledge and justify their efforts. Focus on small goals; don't try to push all of the cool new features all at once, and don't try to do to much with the LMS's API right off the bat. Small goals means lots of rewards; keeping people motivated and happy without overwhelming them. Make sure that any training you do is done within the LMS that professors will need to use. This provides professors unique insight into their students' experiences because those professors are playing with the same tools the students would use. Provide many different types of support, from professional development to documentation to paid help from the LMS provided. In the end, after the final stage of transfer, 80% of the professors surveyed at CU Denver said that they were happy with the new LMS. This is quite a large percentage of people to have happy with any one piece of software and I am sure that the thoughtful transfer process weighed as heavily in their decisions as did the quality of the end product. I really appreciate being given the opportunity to go to this conference. The administrative side of the conference is done so well. Jeff mentioned in his post the talk given by Michael King from IBM and the Watson project. I also really enjoyed this talk. I think it is great that this type of research and data is being used so effectively. It is wonderful that this type of technology is being used and integrated into Health Care and Education. I also came away with a small amount of concern of making sure we as humans don't lose control. I think it is great that we can basically teach robots to think, but what if a robot teaches itself how to think? Okay, I'm not sure I want to go there, and I will say that what is being done is pretty amazing and great! Another golden nugget from the conference was a session titled A Structured Approach to Using Technology to Improve Learning by Steve Green, United States Air Force Academy. Nice that he mentioned Regis in his presentation several times and was very complimentary of Regis. His awareness that every school/college is different, and you need to determine how you want to do your education. I took a picture of his slide around this. If you are doing blended learning it needs to be designed into the course, not just something that is added to the course. Again, I really appreciate having had the opportunity to go to this conference, and if you would like to discuss this or have any other questions, please let me know. Thanks to the eLCC conference planning team for another awesome eLCC conference experience. Perfect weather awaited attendees. This year's Thursday awards luncheon featured Michael King, representative with the IBM Watson project. Michael spoke on how big data can/will transform education. The IBM Watson project is the merger of big data and artificial intelligence to create a question answering supercomputer. King spoke of how technology has gradually risen over the years to become the most important factor within enterprises, particularly within higher education. King pointed out studies that indicated the importance of maintaining and improving workforce skills, and yet there remains a mismatch in skills and talent coming into the workforce from recent college grads. A study from the Institute of Business Value found that over 50% of academic and business leaders felt that higher ed was not meeting the demands of students, industry, or of society. King went on to say that projects such as Watson can provide insights into how best to bridge the student experience gap. 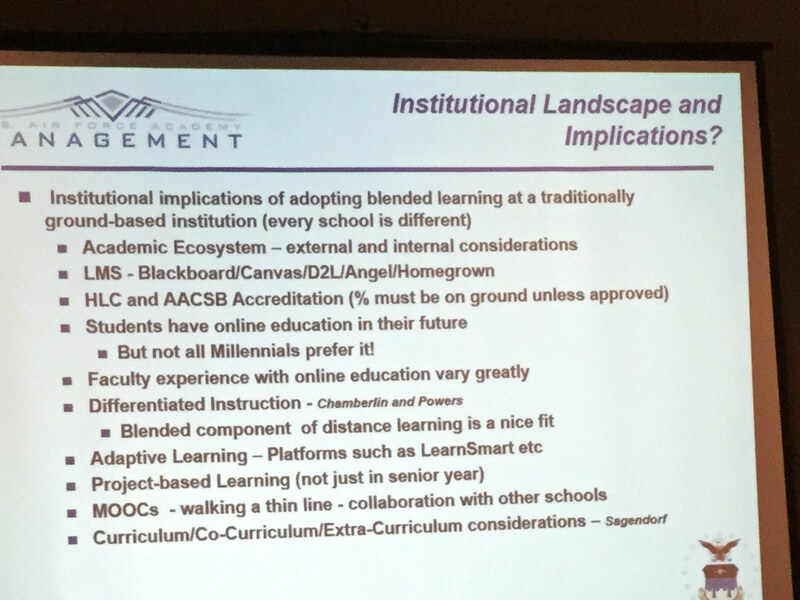 One of his slides showed how Baby Boomers wanted speed with their educational experiences, Gen X wanted great service, and Millennials wanted convenience. And all generational learners wanted better outcomes. And congratulations to this year's award winners for eLearning Advocate (Kae Novak, FRCC), eLearning Educator (Anjali Vaidya, CCCOnline), and the Learning Technologies Team Award (Mursion, UNC). See you at next year's conference!